The Connection Zone is an important part of life at the Centre, connecting people with the projects and services across the Centre, Health Partnership and local community. 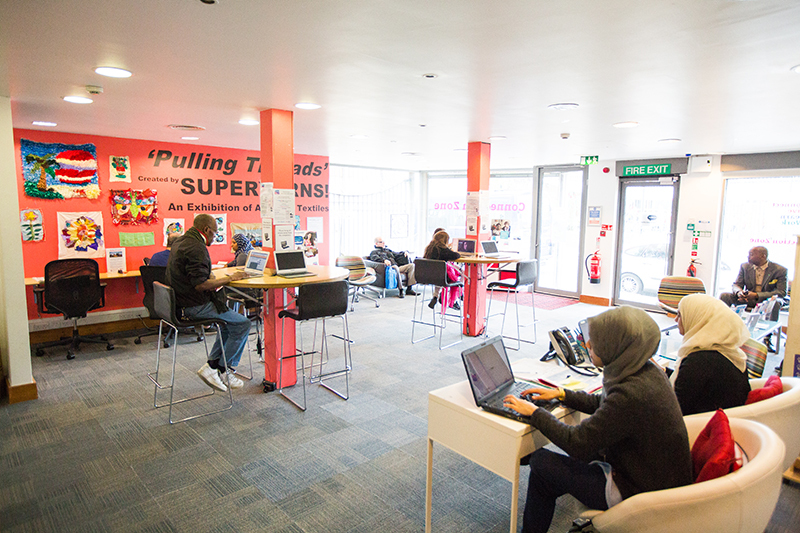 The Connection Zone is our main entry into the Bromley by Bow Centre. It is a place where clients and visitors alike are welcomed to the Centre (and Health Centre), in a vibrant and inclusive space that has something for everyone. Here you will find access to a range of activities that inspire people to learn and grow, where you can find out what’s going on or where you can simply come to see a friendly face, enjoy a hot drink or look for your next job! We welcome approximately 500 people every year and is an important part of life at the Centre, connecting people to all other projects and services across the Centre, Health Partnership and local community.